One of the interesting things about this job is that we are doing it in three languages. So I can’t tell you whether we are looking at the salon, the living room, the library… Who knows? I’m just glad the Armenian workers speak English, so I don’t have to add yet another language to the mix. 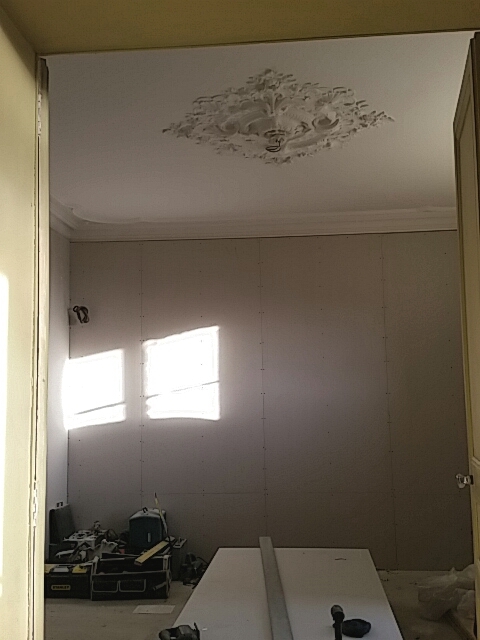 I also can’t say for sure whether the great leap forward has to do with plasterboard, drywall or placo-plātre. I can tell you that the guys are buttoning up the walls, starting here. I can tell you that this is huge. Until the drywall, let’s call it, went in on the ground floor, they couldn’t put in the cabling and all for the heated floors. Also, psychologically, the vibe changes from just hard work to a focus on project completion. The pace and the mood have both picked up. It feels good. Yes, walls do signify, at least emotionally,, progress! Well, does the name for the room not depend on your intention for use of the room? Will there be built in bookshelves? So what are the 3 languages – English, French, ???? Gerard, the drywall is huge. For once the guys are pushing me. They are bugging me for paint colors: music to my ears. It’s construction, of course, so in addition to French we have all the terms in both British and American English. It’s a lift/elevator kind of thing, except that the terms are less widely used, so we all have a bit of a learning curve. I didn’t want a formal living room. You know how I live, Gerard. When you walk in, you head for the kitchen. Aperos at the kitchen island, dinner at the table. Then you might just stay at the table until it’s time to go home. Or to a guest room, if you’re in no shape to drive. So, what to do with that room? I decided on a library with a seriously big-screen TV. When all is done, on the wall you see in the photo, there will be library shelves, broken up by a silkscreen done by my buddy and fellow Francophile Frank Romero. When you walk in and look left you will see more library shelves and a huge TV, intended to put the cinema in home cinema. I’m waiting to buy it because I’m hoping the prices will come down, so I can get something truly enormous. We Americans have a reputation for conspicuous consumption that, every now and again, I’d like to uphold. For a while I called it the TV room but it made my contractors wince, so now it’s the library. If I’m talking to the electricians, who are French, it’s the salon. Three priorities in my mind. Trevor is thinking about TVs, and screens and projectors ……………………………..
Oh, guys, you’re going to love the salon. I’ve got them both covered! It’s aperos and nibbles in kitchen, lingering around table for food and healthy discussion, retire to palm lounge (or terrace if warm) and if you fall asleep on the sofa (as my friend Lisa invariably does) you get left there for the night ……………..
Ooh, palm lounge… If I were going to live there every single day, I’d definitely think about a palm in one of those huge windows. With my schedule and black thumb, maybe palm frond wallpaper is more for me. “Palm lounge” my mother’s name for our tiny front parlour in childhood home. I like your mother’s sense of humor. Next Post In France, anyone can be an artist. Even me.